I’ve admired Ramdesh Kaur for some time now. She’s a person of great courage, passion, and knowledge who has been on a tremendous journey to overcome an eating disorder and a variety of other physical challenges, and to fall in love with her body, her greatest teacher. Ramdesh is a beloved Kundalini Yoga teacher, radio host, and author of The Body Temple: Kundalini Yoga for Body Acceptance, Eating Disorders and Radical Self Love. She writes about her own healing and shares techniques for gaining a positive self-concept, developing a healthy relationship with food, and repairing the mental and physical damage caused by eating disorders. I recently spoke with her about her own self-love practices, her upcoming workshop, how bravely sharing her story has impacted her, and more. Cate: Why do you think Kundalini Yoga resonates with you most, above other self-love and self-care practices and spiritual disciplines? Dr. Ramdesh: I don’t know that I rank my self-love practices. I have organized my life to be an endless flowing stream of self-love and self-care now, so I just find that my Kundalini Yoga practice is an integral part of my life and one that is highly supportive of my well-being. It’s not a new practice for me. It’s more like an old friend that I value and cherish even while I make new friends or meet new people. It’s always there for me, and when I meet it on the mat, we know each other so well at this point that the love is seamless. I find Kundalini Yoga complements the other practices that I do by getting self-love deep into my marrow. It is a practice of incredible depth, so I use Kundalini Yoga to take self-love deep into my psyche and deep into my cells. Cate: I listen to your radio program (Spirit Voyage Radio on Unity FM) all the time and gain so much inspiration and information that feeds my teaching. How did you learn so much about mantra and the practice of Kundalini Yoga in a relatively short amount of time? Dr. Ramdesh: Oh, I just dove into the deep end of the pool. When I found mantra, it struck me so profoundly that I knew it was my path. I went from not knowing what it was to chanting six hours a day. I have a rather extreme personality, and I’m very academic naturally (I just finished my PhD! ), so I began to study everything I could get my hands on. The study and practice of mantra were a huge part of my life for many years. So, even if it was “a relatively short period of time,” it was extremely intensive exposure to it and applied study. I just loved it and needed to know everything I could about it. I still learn new things all the time. Cate: I’m really looking forward to your workshop at Sat Nam Fest. What experience are you hoping to create for your students? Dr. Ramdesh: I’m hoping to create a resonant field of love where the normal mind chatter, cultural programming, or negative patterning that exists within the average person’s mind is suspended, and the ability to love oneself becomes natural. In an environment like that, radical self-love becomes possible. Cate: You use the term radical self-love in your book and for your workshop. Can you elaborate on what it means to you? Dr. Ramdesh: Radical self-love is a state where every cell of your body is animated with love — every brain cell is vibrating with love, and every molecule of your being, every organ, every bone, every hair follicle, every single part of you feels its natural state of love. Love stops being something you do, and becomes something you are. From that state, all healing is possible and relief from negative thoughts is inevitable. Cate: How can we move ourselves toward radical self-love and continually renew our commitment to it? I work my own program because I know I have to hold that resonance for others, so my own practice goes deeper all the time. I make sure I have a self-love altar in my home, dedicated to this practice. What can you do? All of these things and more. Finding ways to infuse your practice and your day with moments of self-love and self-acceptance add up. You can choose healthy foods to fuel your body temple and consciously prepare them with ceremony. You can choose a 40-day practice just for yourself and your body. You can take five minutes to go outside and walk on the grass barefoot. You can make the first thing you do everyday when you are still in bed be saying, “I love you. My body, I adore you. My mind, I honor you. My spirit, I am you. I am in love with all that I am and give love to all that I see.” Radical self-love never stops. It’s a river that flows through you and it feels so wonderful. Cate: Has publicly talking and writing about your eating disorder history had an impact on your own journey? Dr. Ramdesh: I think it has for sure, although I have been healthy for years. Part of eating disorders is shame and hiding. You don’t want people to know what you’re doing. So for me, I came out publicly, and I think it really healed that part of me that was ashamed of myself. I just refused to allow shame to have a voice anymore, and it went away. I am who I am, and I have been through what I’ve been through. There’s no shame in my game anymore. It’s just a part of me, and I have to say when shame goes away, so much of the grip of the disorder releases its hold. I’m not trying to be healthy anymore, I just am. Now, health and peace of mind is a nature state of existence for me. So yeah, I think for me the lesson is, whatever you are ashamed of or whatever lives in the darkness within you, bring it out into the light. It’s so much less powerful in the light. Cate discovered Kundalini Yoga by accident nearly 20 years ago and was surprised and thrilled by how engaged, energized, and inspired it made her feel. She’s been practicing ever since. In 2008, Cate completed her Level 1 (200 hr) teacher training with Hari Kaur Khalsa of Hari NYC. In 2012, she broadened her knowledge with a very special Holistic Hatha Yoga training (300 hr) with Amy Witmyer of Sacred Space. 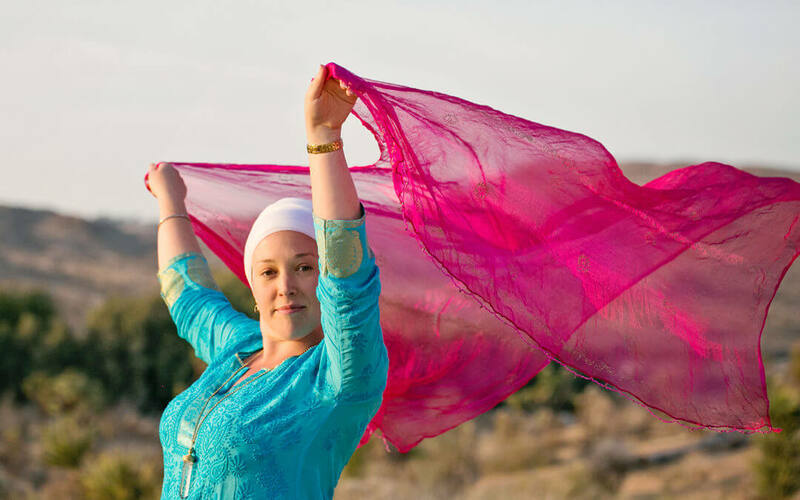 More recently, Cate completed her training in Shakti Dance™ with Dharma Devi Kaur, a beautiful dance practice that grew out of the teachings of Kundalini Yoga. She lives in Montclair, New Jersey with her husband and two teenage children, and she co-owns Montclair Kundalini Yoga, a business dedicated to sharing the teachings of Kundalini Yoga and Shakti Dance™ with all who want to experience it.